Have You Tried This Ride? Do you love riding motorcycles? Have you been looking to purchase a new bike to ride? If you are a lover of bikes, you definitely need to check out this auction here! This lot features a Honda CRF450X motorcycle. New motorcycles can be extremely pricey costing upwards of thousands and thousands of dollars, but luckily if you bid on this auction before closing time you can have a chance at owning this cool bike for one easy low price! This auction is located in Tucson, Arizona and the closing time will be on April 15 at 1:22 p.m central time. Bidders are cautioned to inspect prior to bidding. Repairs needed, but not limited to: Unit is inoperable and recommended for parts. Please contact the custodian for inspection dates and times and for removal arrangements. For additional information about the proposed sale, please contact Terry Walkup at 520-514-4900. The bid on this motorcycle is currently $500 and there has been 5 bidders so far so make sure that you become the very next person to bid and have a chance at winning your very own Honda bike! For any further information, simply click here to subscribe to www.governmentauctions.org for your FREE 3 day trial. Take A Ride On This Bike! Have you always wanted to purchase your very own motorcycle to ride on? Well then check this out because this auction can make your dreams come true! 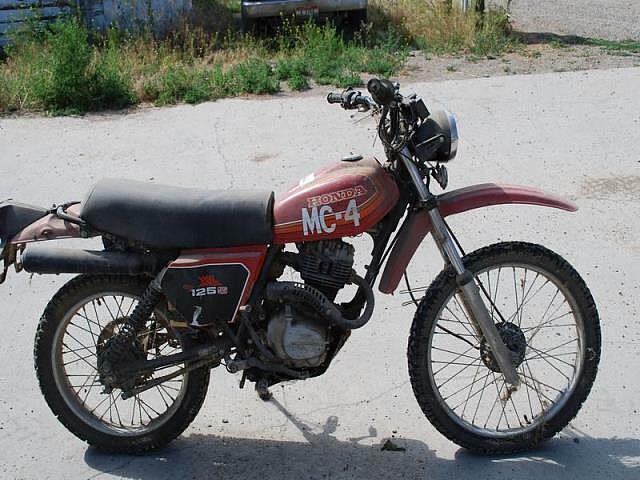 This auction features a 1981 Yamaha motorcycle. New motorcycles can be extremely pricey costing upwards of thousands and thousands of dollars, but luckily if you bid on this auction before closing time you can have a chance at owning this bike for a jaw dropping price! This auction is located in Gooding, Idaho and the closing time will be on March 21 at 7:43 p.m central time. Inspection of this item is highly recommended. Repairs needed, but not limited to: has not been used or started in over 2 years; otherwise, no known mechanical problems; working condition not guaranteed. Please contact the custodian for inspection dates and times and for removal arrangement For additional information about the proposed sale, please contact Derek Romer at 208-944-3665. The bid on this motorcycle is currently $455 and there has been 7 bidders so far so make sure that you become the very next person to bid and have a chance at winning your very own Yamaha bike! For any further information, simply click here to subscribe to www.governmentauctions.org for your FREE 3 day trial. This auction features one lot consisting of a 2007 Harley Davidson Heritage Soft-tail Motorcycle. VIN 1HD1BW5177Y086825. The current odometer reads 42,225 miles. This public auction sale will take place on January 8, 2019 at 2 p.m. This item will be sold “as is, where is” with no attestation as to the accuracy of the description and the condition. An inspection of this vehicle is strongly suggested and will take place on February 20, 2019 from 1:00 PM until 3:00 PM (local time) at the Bloomington, MN lot. New Harley Davidson bikes can be extremely pricey costing upwards of thousands and thousands of dollars, but luckily if you bid on this auction before closing time you can have a chance at owning this bike for a jaw dropping price! This auction is located in Bloomington, MN and the closing time will be on February 26 at 10:00 a.m central time. For additional information about the proposed sale, please contact Scott Franks at 615-764-6456. The bid on this motorcycle is currently $4,200 and there has been 5 bidders so far so make sure that you become the very next person to bid and have a chance at winning your very own Harley Bike! For any further information, simply click here to subscribe to www.governmentauctions.org for your FREE 3 day trial. Get On The Road With This Beauty! Are you looking to purchase a high quality motorcycle? Well then look no further because this auction is featuring a top of the line bike! This lot consists of a 2010 Harley Davidson FLHXSE motorcycle in a bright blue color. This motorcycle has a 2-cylinder, twin cam 110 engine with 3,302 miles currently on the odometer. New Harley Davidson bikes can be a fortune, costing upwards of thousands and thousands of dollars, but if you bid on this auction today you can have a chance of making this Harley bike all yours for a fraction of the price! If you would like to inspect this motorcycle in person before deciding whether or not to place a bid then you must contact the custodian ahead of time to schedule an appointment. Inspection will only be held on July 31, 2018 from 10:00 AM until 12:00 PM (local time) at the Lawrence, MA lot. This auction is located in Lawrence, Massachusetts, and the closing time is on August 7 at 10:01 am central time. Right now, the current bid is $8,000 USD and there have been 6 bidders so far, so make sure that you become the very next one to win this beauty! For any further information, simply click here to subscribe to www.governmentauctions.org for your FREE 3 day trial. Are you on the market for a new dirt bike? Well then stop searching and get ready to ride because this auction is ready to go! This lot consists of a 2004 Yamaha dirt bike in a bright blue color. This bike comes equipped with an electric start, a new crank sensor, a battery and spark plug, a 2-stroke engine and more! For over 60 years now, Yamaha has been one of the top manufacturers in the country known for its variety of motorized products. New dirt bikes can be very costly, but if you bid on this item before closing time you can have a chance at getting this bike for a steal! If you would like to inspect this dirt bike in person before deciding whether or not to place a bid then you must contact the custodian ahead of time to schedule an appointment. This auction is located in Salem, Oregon, and the closing time is on June 26 at 7:31 pm central time. Right now, the current bid is $785 and there have been 7 bidders so far, so make sure that you become the very next person to bid and have a chance at bringing home this awesome bike. For any further information, simply click here to subscribe to www.governmentauctions.org for your FREE 3 day trial. Have you always wanted to feel the thrill of riding a motorcycle? Have you ever imagined what it would be like to own one? Well, this auction is here to make your wildest dreams come to fruition! This auction has one lot that consists of a 2009 Hyosung Comet motorcycle. This Hyosung motorcycle has approximately 1,609 miles on it, and the gross vehicle weight is 750 pounds. The motorcycle also has a twin cam and 8 valve. The bike does start with a jump, and a key is included. The bike has cosmetic damage on it, and it was probably used as a trainer bike by the federal government. Parts may be missing an repairs may be required, so if you would like to inspect this motorcycle in person before deciding whether or not to place a bid then you must contact the auctioneer ahead of time to schedule an appointment. This auction is located in Harrisburg, Pennsylvania, and the closing time is on February 23 at 6:00 pm central time. Right now the current bid is $606 and there have been 3 bidders so far, so make sure you are the very next one! For any further information, simply click here to subscribe to www.governmentauctions.org for your FREE 3 day trial. Have you always wanted your very own scooter, motorcycle, or dirt bike? Do you want to feel the thrill as you rev that throttle and hear the engine? Well, put your helmet on because this auction is here to deliver you the thrill of your life! This auction has one lot that consists of a Honda Mdl CT TRAIL 110 motor scooter with a 1055 CC air cooled single cylinder engine. This motor scooter is disassembled, but it appears to have all major parts. This bike includes a box of parts and a spare tire, but some parts including bolts, nuts, and other miscellaneous parts may be missing. The rear tire is low on air, and this scooter has been stored outside. Inspection is highly recommended, so if you would like to check this motor scooter out in person before deciding whether or not to place a bid, then you must contact the auctioneer ahead of time to schedule an appointment. This auction is located in Caldwell, Indiana, and the closing time is on February 22 at 8:31 pm central time. Right now, the current bid is $125 and there have been 3 bidders so far. For any further information, simply click here to subscribe to www.governmentauctions.org for your FREE 3 day trial. Get Those Leather Boots Ready To Ride This Motorcycle! Have you always had the desire to own your very own motorcycle? Was it a childhood dream of yours to cruise down a freeway while hearing that engine purr? Well, put your leather boots and jackets on because this auction is here to turn your dream into a reality! This auction has one lot that consists of a 2009 Hyosung Motorcycle. This Hyosung motorcycle was manufactured in November 2008, and it has 1,721 miles on it. The bike does start with a jump, and a key is included. The bike has cosmetic damage on it, and it was probably used as a trainer bike by the federal government. Parts may be missing and repairs may be required, so if you would like to inspect this awesome motorcycle in person before deciding whether or not to place a bid then you must contact the auctioneer ahead of time to schedule an appointment. This auction is located in Harrisburg, Pennsylvania, and the closing time is on February 9 at 6:00 pm central time. Right now the current bid is $530 and there have been 9 bidders, so be sure that you are the next one! For any further information, simply click here to subscribe to www.governmentauctions.org for your FREE 3 day trial. These Motorcycles Are A Must Have! Do you love riding on motorcycles? Do you want to feel the thrill of cruising down the street while the wind blows right past you? Well, put those biker boots and leather jacket on because this auction will have you riding down the freeway in no time! This auction has one lot that features two motorcycles. One motorcycle is from 1980 and has 2,045 miles on it, and the other motorcycle is from 1981 and has 3,564 miles on it. Both bikes are inoperable, and the tires are in fair condition. Since there are two motorcycles included in this auction, this is the perfect opportunity for you and a friend or family member to go out together and spend some quality time riding your motorcycles! Repairs are needed, so if you would like to inspect these motorcycles in person before deciding whether or not to place a bid then you must contact the auctioneer ahead of time to schedule an appointment. This auction is located in Carmen, Idaho, and the closing time is on December 14 at 7:13 pm central time. Right now, the current bid is $505 and there have been 8 bidders so far. For any further information, simply click here to subscribe to www.governmentauctions.org for your FREE 3 day trial. This Motorcycle Will Make You The Coolest Person In Town! Have you always wanted to ride your very own motorcycle? Do you envision yourself wearing a leather jacket while cruising down the freeway? Well, put your helmet and biker boots on because this auction will get you on your dream bike soon! 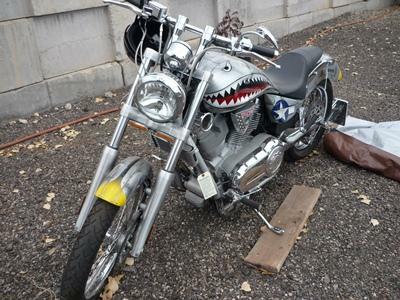 This auction has one lot that consists of a 2003 Victory Vegas motorcycle. The motorcycle has custom paint with a matching helmet. The paint job looks so amazing that others will be begging you to take a picture with it! You will be the coolest person in town! If you have a friend or family member that enjoys riding a motorcycle, this auction can be the perfect gift for a holiday or birthday. Parts may be missing and repairs may be required, so if would like to inspect it in person before deciding whether or not to place a bid then you must contact the auctioneer ahead of time to schedule an appointment. This auction is located in Englewood, California, and the closing time is on December 5 at 10:00 am central time. Right now, the current bid is $1,600 and there have been 4 bidders so far, so be sure to be the next one! For any further information, simply click here to subscribe to www.governmentauctions.org for your FREE 3 day trial. Feel Your Hair Blowing In The Wind When You Ride Your Very Own Motorcycle! Hear That Engine Purr When You Rev The Throttle Of Your Very Own Motorcycle! Rev The Throttle Of Your Very Own Motorcycle! 1974 Suzuki Motorcycle: Vroom Vroom!